Modi and Yameen held talks on Monday, discussing a range of bilateral and regional issues. The two leaders “agreed to strengthen cooperation to enhance maritime security in the Indian Ocean Region through coordinated patrolling and aerial surveillance, exchange of information and capacity building,” according to a joint statement issued in the aftermath of Monday’s talks. “We will not allow our countries to be used for activities which can be harmful to each other’s interests,” Modi asserted at his press statement with Solih after their meeting. On the sidelines of the summit meeting, the two countries signed four major bilateral agreements. The newly signed bilateral agreements between the two countries include an agreement on visa arrangements to facilitate people-to-people ties and tourism, a memorandum of understanding on cultural cooperation, an agreement on agribusiness, and a joint declaration setting out a cooperative agenda on information technology and communications technology. 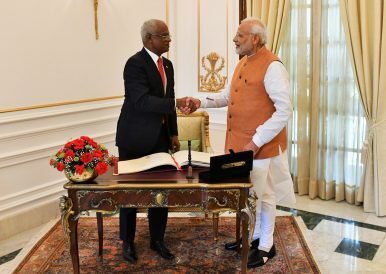 Modi and Solih discussed a range of other issues, including climate change, which is an acute threat to the Maldives’ livelihood. Modi and Solih pledged to “work towards strengthening the global response to climate change, through the UNFCCC, and the Paris Agreement.” According to the joint statement, India will play a role in helping the Maldives Police Service and National Defense Force improve its capacity to combat terrorism, organized crime, piracy, and human trafficking. To offer the Maldives an alternative to additional Chinese financing, Modi announced that India would provide Malé with a $1.4 billion financial assistance package that would comprise a range of instruments, ranging from fiscal support, currency swaps, and concessional lines of credit. The specifics of the announcement have not been made apparent. Aside from the Indian assistance package, Modi and Solih agreed to improve connectivity and trade between India and the Maldives. Solih, who was inaugurated a month ago, made a point of emphasizing better ties with India in his inaugural address. Modi traveled to the Maldives for the first time since taking office in May 2014 to attend Solih’s inauguration. Modi’s trip to the Maldives marked the completion of trips to all of India’s neighboring states since his inauguration. In 2014, the Modi government adopted a “neighborhood first” foreign policy, giving India’s neighboring states priority. Solih, in New Delhi, similarly committed the Maldives to an “India first” policy.